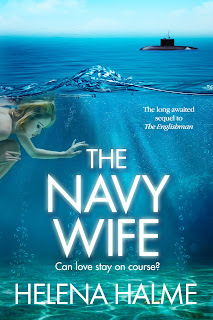 The Navy Wife, the long-awated sequel to the Nordic tale of long-distance love, The Englishman, is now out in Kindle form. I know it's been a long time coming, so I am absolutely delighted that I can finally say the novel is published. To buy, click this link. Marriage to The Englishman, Peter, was a mere dream for Kaisa when she was a student in Helsinki. It’s now 1984 and Kaisa wants a career as well as Peter. But no one wants to give a job to a young, foreign Navy Wife. Kaisa’s frustration creates bitter rows between the newlyweds, which she regrets each time her submariner husband goes away. Enter rich, charming and clever Duncan, who seems to have all the answers to Kaisa’s problems. With Peter away on a long patrol, can the lonely and bored Kaisa resist Duncan’s advances? The Navy Wife is available on Kindle here. You need to be a member of OpinioN8 to add comments!